, an English poet, descended of a Cornish family, was the third son of the rev. 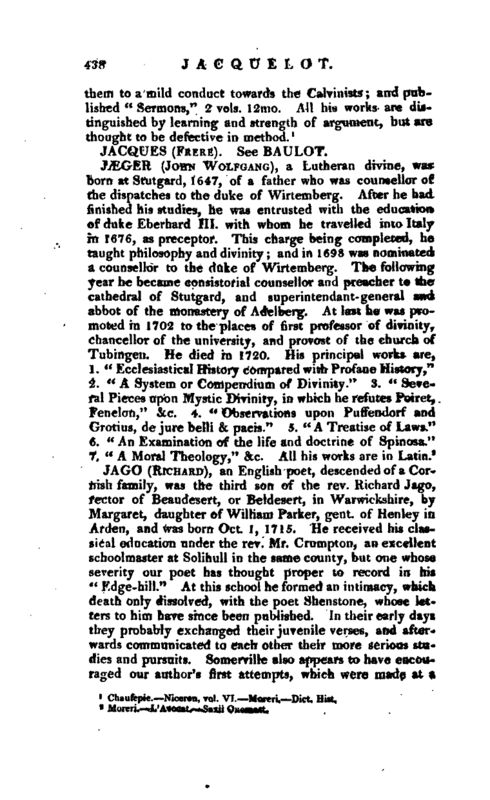 Richard Jago, rector of Beaudesert, or Beldesert, in Warwickshire, by Margaret, daughter of William Parker, gent, of Henley in Arden, and was born Oct. 1, 1715. He received his classical education under the rev. Mr. Crumpton, an excellent schoolmaster at Solihull in the same county, but one whose severity our poet has thought proper to record in his “Edge-hill.” At this school he formed an intimacy, which death only dissolved, with the poet Shenstone, whose letters to him have since been published. In their early days they probably exchanged their juvenile verses, and afterwards communicated to each other their more serious studies and pursuits. Somerville also appears to have encouraged our author’s first attempts, which were made at a | yet earlier period, when under his father’s humble roof. From school he was entered as a servitor of University college, Oxford, where Shenstone, then a commoner of Pembroke, the late rev. Richard Greaves, Mr. Whistler, and others who appear among Shenstone’s correspondents, showed him every respect, notwithstanding the inferiority of his rank. A young man of whatever merit, who was servitor, was usually visited, if visited at all, with secrecy, but this prejudice is now so much abolished that the same circumspection is not thought necessary. He took his master’s degree July 9, 1738, having entered into the church the year before, and served the curacy of Snitterfield, near Stratford-upon-Avon. His father died in 1740. In 1744, or according to Shenstone’s letters, in 1743, he. married Dorothea Susanna Fancourt, daughter of the rev. Fancourt of Kimcote in Leicestershire, a young lady whom he had known from her childhood. For several years after his marriage, he resided at Harbury, to which living he was presented in 1746; lord Willoughby de Broke gave him also the living of Chesterton, at a small distance from Harbury. These two benefices together did not produce more than one hundred pounds a year. In 1751 he had the misfortune to lose his wife, who appears to have been an amiable and accomplished woman, and was left with the care of seven very young children. In 1754, lord Clare, the late earl Nugent, procured for him from Dr. Madox, bishop of Worcester, the vicarage of Snitterfield, worth about 140l. In 1759 he married a second wife, Margaret, daughter of James Underwood, esq. of Rudgely, in Staffordshire, who survived him, but by whom he had no children. Some of his smaller pieces of poetry had before this time been inserted in Dodsley’s collection, but he put in for higher claims, by publishing the poem of “Edgehill,” in 1767; and in 1768, his more popular fable of “Labour and Genius.” In 1771 he was presented by his kind patron lord Willoughby de Broke, to the living of Kimcote, formerly held by his first wife’s father, which being worth near 300l. a year, enabled him to maintain his family with ease and comfort, especially as he retained Snitterfield, and resigned only the trifling living of Harbury. During the latter part of his life, when the infirmities of age made their approach, he resided almost entirely at Snitterfield, where he amused himself with improving | the vicarage-house, and ornamenting his grounds, a taste he probably caught from Shenstone, but which he contrived to indulge at a much less expence. 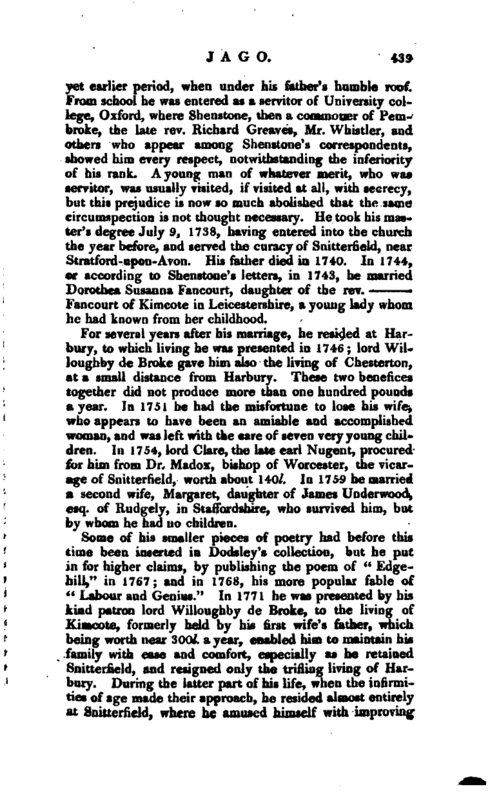 He died after a short illness, May 8th, 1781, aged sixty-five years, and was buried according to his desire, in a vault which he had made for his family in the church at Snitterfield. Three of his daughters, by the first wife, survived him. In 1784, his poems, as corrected, improved, and enlarged by the author a short time before his death, with some additional pieces, were published by his friend, the late John Scott Hylton, esq. of Lapall- house near Hales Owen, who was likewise the correspondent of Shenstone. 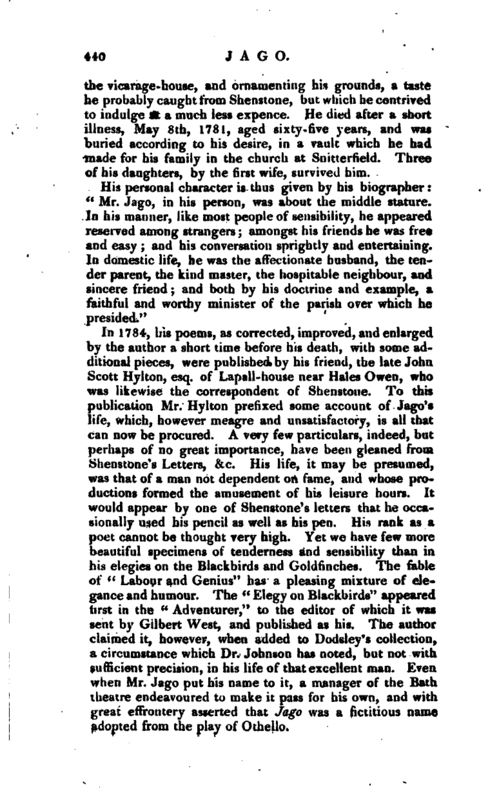 To this publication Mr. Hylton prefixed some account of Jago’s life, which, however meagre and unsatisfactory, is all that can now be procured. 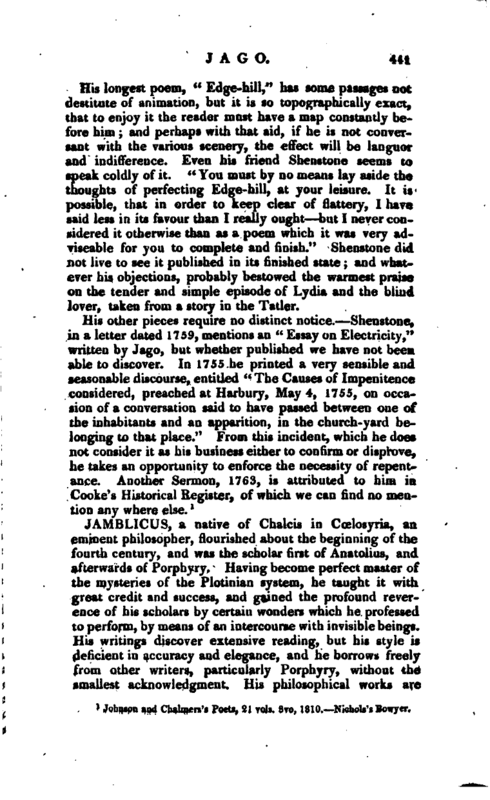 A very few particulars, indeed, but perhaps’ of no great importance, have been gleaned from Shenstone’s Letters, &c. His life, it may be presumed, was that of a man not dependent on fame, and whose productions formed the amusement of his leisure hours. It would appear by one of Shenstone' s letters that he occasionally used his pencil as well as his pen. His rank as a poet cannot be thought very high. Yet we have few more beautiful specimens of tenderness and sensibility than in, his elegies on the Blackbirds and Goldfinches. The fable of “Labour and Genius” has a pleasing mixture of elegance and humour. The “Elegy on Blackbirds” appeared first in the “Adventurer,” to the editor of which it was sent by Gilbert West, and published as his. The author claimed it, however, when added to Dodsley’s collection, a circumstance which Dr. Johnson has noted, but not with sufficient precision, in his life of that excellent man. Even when Mr. Jago put his name to it, a manager of the Bath theatre endeavoured to make it pass for his own, and with great effrontery asserted that Jago was a fictitious name Adopted from the play of Othello. | His longest poem, “Edge-hill,” has some passages not destitute of animation, but it is so topographically exact, that to enjoy it the reader must have a map constantly before him; and perhaps with that aid, if he is not conversant with the various scenery, the effect will be languor and indifference. Even his friend Shenstone seems to speak coldly of it. “You must by no means lay aside the thoughts of perfecting Edge-hill, at your leisure. It is possible, that in order to keep clear of. flattery, I have said less in its favour than I really ought but I never considered it otherwise than as a poem which it was very adviseable for you to complete and finish.” Shenstone did not live to see it published in its finished state; and whatever his objections, probably bestowed the warmest praise on the tender and simple episode of Lydia and the blind lover, taken from a story in the Tatler. Johnson and Chalmers’s Poets, 21 vols, 8vo, 1810. Nichols’s Bowyer.